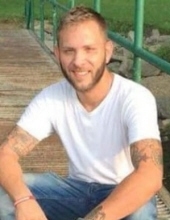 Mr. Michael Kyle Penick of Greensburg, Kentucky, son of Michael H. Penick of Greensburg and Catherine "Cathy" Atwell Elliott of Louisville, was born on Tuesday, December 4, 1990 in Louisville, Kentucky and departed this life on Wednesday, September 19, 2018 in Greensburg. He was 27 years, 9 months, and 15 days of age. Besides his parents, Kyle is survived by two children: Devyn Caulk of Campbellsville and Lilly-Ann Penick Copeland; grandparents: Charles Penick of Greensburg and Linda Sue Shofner of Green County; a half-brother and a half-sister: Christopher Atwell and Catrina Atwell both of Louisville; aunts and uncles: Charles Erick Penick of Nashville, Debbie Evans and Jamie Huffman both of Greensburg, Georgia Damewood, Debra Bradley both of Louisville, Darlene Caldwell of Taylorsville, Teresa Rawlings of Calvary, James Caldwell, Jr. of Lebanon, Susie Caldwell of Taylorsville, Ronda Bland of Finley, and Charles Atwell of Lebanon; and a host of other relatives and friends. To plant a tree in memory of Michael Kyle Penick, please visit our Tribute Store. "Email Address" would like to share the life celebration of Michael Kyle Penick. Click on the "link" to go to share a favorite memory or leave a condolence message for the family.